This is a picture of one of the counterfeit frames Specialized tested. There have been a lot of people coming into the shoppe for tires to put on their new carbon wheels lately. Several times when I've asked which set they went with they've told me some "knock-offs" from China that they have paid $400 or so. This made me concerned because I understand how badly a ride can go if your wheels give up. So I started looking into counterfeit product. Specialized has someone whose full-time job is finding and battling counterfeiters. They even picked up some of the product and tested it. With frames, the aluminum head tube cups became separated which will cause wobbly steering. They did say they found varying degrees of quality, but how can you know with a fake product anyway which company is doing a decent job and which is producing dangerous product. None of the counterfeit companies are doing quality control. Most people don't realize when they buy a bike, they aren't only paying for cost of labor and materials. They also are paying for the research and development, which includes safety and fatigue testing, and a company that has their name on the product. That means the company wants to defend their reputation and is willing to take care of you when their goods have issues, sometimes even if it's not their fault. Last thing to mention. At The Bike Shoppe, we heard from a local guy that is quite internet savvy, but had a lapse in judgment. He ignored all the rules he typically suggests others follow, such as never purchase something with a cashier's check or money order, and tried to purchase a counterfeit Shimano grouppo. When he didn't receive it he contacted the company and they said he had to buy multiple groupos to get the price advertised. So he either had to send them additional money, and risk the possibility of losing much more money, or just cut his losses. 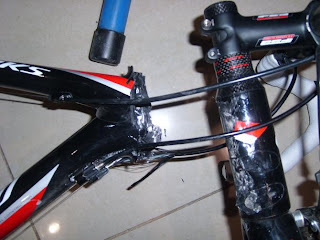 In order to stay away with those fake bike kits, we need to do our research first and the majority will tend to figure out whether something is straight-up or not. As a matter of fact, we sometimes tend to buy those low cost bikes without even knowing its quality. I know several bike companies who sell good and high-quality products like Trek and Morpheus.